For other uses, see Punch and Judy (disambiguation). Punch and Judy is a traditional puppet show featuring Mr. Punch and his wife Judy. The performance consists of a sequence of short scenes, each depicting an interaction between two characters, most typically Mr. Punch and one other character who usually falls victim to Punch's slap stick. It is often associated with traditional British culture. The various episodes of Punch comedy—often provoking shocked laughter—are dominated by the clowning of Mr. Punch. The show is performed by a single puppeteer inside the booth, known since Victorian times as a "professor" or "punchman", and assisted sometimes by a "bottler" who corrals the audience outside the booth, introduces the performance, and collects the money ("the bottle"). The bottler might also play accompanying music or sound effects on a drum or guitar, and engage in back chat with the puppets, sometimes repeating lines that may have been difficult for the audience to understand. In Victorian times, the drum and pan pipes were the instruments of choice. Today, the audience is also encouraged to participate, calling out to the characters on the stage to warn them of danger or clue them in to what is going on behind their backs. Also nowadays, most professors work solo, since the need for a bottler became less important when busking with the show gave way to paid engagements at private parties or public events. "[Pulcinella] went down particularly well with Restoration British audiences, fun-starved after years of Puritanism. We soon changed Punch's name, transformed him from a marionette to a hand puppet, and he became, really, a spirit of Britain – a subversive maverick who defies authority, a kind of puppet equivalent to our political cartoons." —Punch and Judy showman Glyn Edwards. The Punch and Judy show has roots in the 16th-century Italian commedia dell'arte. The figure of Punch is derived from the Neapolitan stock character of Pulcinella, which was anglicized to Punchinello. He is a manifestation of the Lord of Misrule and Trickster figures of deep-rooted myths. Punch's wife was originally called "Joan." The figure who later became Mr. Punch made his first recorded appearance in England on 9 May 1662, which is traditionally reckoned as Punch's UK birthday. Punch and Judy began to emerge during the Restoration Period (beginning in 1660) , a period during which art and theatre thrived. King Charles II took the throne in 1660 and replaced Puritan leader Oliver Cromwell, and theatre culture began to change. Cromwell strictly adhered to the Puritan belief that theatre was immoral and should be banned. King Charles II's ascension to the throne ended the Interregnum (means "between kings", a time with no monarchs on the throne) and ushered in a more tolerant period of art and culture. The diarist Samuel Pepys observed a marionette show featuring an early version of the Punch character in Covent Garden in London. It was performed by Italian puppet showman Pietro Gimonde, a.k.a. "Signor Bologna." Pepys described the event in his diary as "an Italian puppet play, that is within the rails there, which is very pretty." In the British Punch and Judy show, Punch speaks in a distinctive squawking voice, produced by a contrivance known as a swazzle or swatchel which the professor holds in his mouth, transmitting his gleeful cackle. This gives Punch a vocal quality as though he were speaking through a kazoo. Joan's name was changed to Judy because "Judy" was easier to enunciate with the swazzle than "Joan". So important is Punch's signature sound that it is a matter of some controversy within Punch and Judy circles as to whether a "non-swazzled" show can be considered a true Punch and Judy Show. Other characters do not use the swazzle, so the Punchman has to switch back and forth while still holding the device in his mouth. Punch and Judy shows were traditionally marionette shows when they were brought over from Italy, but were later reinvented in the glove puppet style to accommodate the characters' violent movements without the obstruction of marionette strings . Glove puppets were often operated by placing the thumb in one arm, the middle, ring, and pinky fingers in the other arm, and the index finger in the head. In the early 18th century, the puppet theatre starring Punch was at its height, with showman Martin Powell attracting sizable crowds at both his Punch's Theatre at Covent Garden and earlier in provincial Bath, Somerset. Powell has been credited with being "largely responsible for the form taken by the drama of Punch and Judy". In 1721, a puppet theatre opened in Dublin that ran for decades. The cross-dressing actress Charlotte Charke ran the successful but short-lived Punch's Theatre in the Old Tennis Court at St. James's, Westminster, presenting adaptations of Shakespeare as well as plays by herself, her father Colley Cibber, and her friend Henry Fielding. Fielding eventually ran his own puppet theatre under the pseudonym Madame de la Nash to avoid the censorship concomitant with the Theatre Licensing Act of 1737. Punch was extremely popular in Paris and, by the end of the 18th century, he was also playing in Britain's American colonies, where even George Washington bought tickets for a show. However, marionette productions were expensive and cumbersome to mount and transport, presented in empty halls, the back rooms of taverns, or within large tents at England's yearly agricultural events at Bartholomew Fair and Mayfair. In the latter half of the 18th century, marionette companies began to give way to glove-puppet shows, performed from within a narrow, lightweight booth by one puppeteer, usually with an assistant, or "bottler," to gather a crowd and collect money. These shows might travel through country towns or move from corner to corner along busy London streets, giving many performances in a single day. The character of Punch adapted to the new format, going from a stringed comedian who might say outrageous things to a more aggressive glove-puppet who could do outrageous—and often violent—things to the other characters. The mobile puppet booth of the late 18th- and early 19th-century Punch and Judy glove-puppet show was originally covered in checked bed ticking or whatever inexpensive cloth might come to hand. Later Victorian booths were gaudier affairs, particularly those used for Christmas parties and other indoor performances. In the 20th century, however, red-and-white-striped puppet booths became iconic features on the beaches of many English seaside and summer holiday resorts. Such striped cloth is the most common covering today, wherever the show might be performed. A more substantial change came over time to the show's target audience. The show was originally intended for adults, but it changed into primarily a children's entertainment in the late Victorian era. Ancient members of the show's cast ceased to be included, such as the Devil and Punch's mistress "Pretty Polly," when they came to be seen as inappropriate for young audiences. The story changes, but some phrases remain the same for decades or even centuries. For example, Punch dispatches his foes each in turn and still squeaks his famous catchphrase: "That's the way to do it!" The term "pleased as Punch" is derived from Punch and Judy; specifically, Mr. Punch's characteristic sense of gleeful self-satisfaction. Modern British performances of Punch and Judy are no longer exclusively the traditional seaside children's entertainments which they had become. They can now be seen at carnivals, festivals, birthday parties, and other celebratory occasions. Punch and Judy, taken in Islington, north London. The characters in a Punch and Judy show are not fixed. They are similar to the cast of a soap opera or a folk tale such as Robin Hood: the principal characters must appear, but the lesser characters are included at the discretion of the performer. New characters may be added and older characters dropped as the tradition changes. Other characters included Boxers, Chinese Plate Spinners, topical figures, a trick puppet with an extending neck (the "Courtier"), and a monkey. A live Dog Toby was once a regular featured novelty routine, sitting on the playboard and performing 'with' the puppets. Punch wears a brightly coloured (traditionally red) jester's motley and sugarloaf hat with a tassel. He is a hunchback whose hooked nose almost meets his curved, jutting chin. He carries a stick (called a slapstick) as large as himself, which he freely uses upon most of the other characters in the show. Judy wore an apron, a blue dress, and a bonnet. Glyn Edwards has likened the story of Punch and Judy to the story of Cinderella. He points out that there are parts of the Cinderella story which everyone knows, namely the cruel step sisters, the invitation to the ball, the handsome prince, the fairy godmother, Cinderella's dress turning to rags at midnight, the glass slipper left behind, the prince searching for its owner, and the happy ending. None of these elements can be omitted and the famous story still be told. The same principle applies to Punch and Judy. Everyone knows that Punch mishandles the baby, that Punch and Judy quarrel and fight, that a policeman comes for Punch and gets a taste of his stick, that Punch has a gleeful run-in with a variety of other figures and takes his stick to them all, that eventually he faces his final foe (which might be a hangman, the devil, a crocodile, or a ghost). Edwards contends that a proper Punch and Judy show requires these elements or the audience will feel let down. Peter Fraser writes, "the drama developed as a succession of incidents which the audience could join or leave at any time, and much of the show was impromptu." This was elaborated by George Speaight, who explained that the plotline "is like a story compiled in a parlour game of Consequences ... the show should, indeed, not be regarded as a story at all but a succession of encounters." Robert Leach makes it clear that "the story is a conceptual entity, not a set text: the means of telling it, therefore, are always variable." Rosalind Crone asserts that the story needed to be episodic so that passersby on the street could easily join or leave the audience during a performance. Much emphasis is often placed on the first printed script of Punch and Judy, in 1827. It was based on a show by travelling performer Giovanni Piccini, illustrated by George Cruikshank, and written by John Payne Collier. This is the only surviving script of a performance, and its accuracy is questioned. The performance was stopped frequently to allow Collier and Cruikshank to write and sketch and, in the words of Speaight, Collier is someone of whom "the full list of his forgeries has not yet been reckoned, and the myths he propagated are still being repeated. (His) 'Punch and Judy' is to be warmly welcomed as the first history of puppets in England, but it is also sadly to be examined as the first experiment of a literary criminal." The tale of Punch and Judy varies from puppeteer to puppeteer, as previously with Punchinello and Joan, and it has changed over time. Nonetheless, the skeletal outline is often recognizable. It typically involves Punch behaving outrageously, struggling with his wife Judy and the baby, and then triumphing in a series of encounters with the forces of law and order (and often the supernatural), interspersed with jokes and songs. A typical show as performed currently in the UK will start with the arrival of Mr. Punch, followed by the introduction of Judy. They may well kiss and dance before Judy requests Mr. Punch to look after the baby. Punch will fail to carry out this task appropriately. It is rare for Punch to hit his baby these days, but he may well sit on it in a failed attempt to "babysit", or drop it, or even let it go through a sausage machine. In any event, Judy will return, will be outraged, will fetch a stick, and the knockabout will commence. A policeman will arrive in response to the mayhem and will himself be felled by Punch's slapstick. All this is carried out at breakneck farcical speed with much involvement from a gleefully shouting audience. From here on anything goes. Joey the Clown might appear and suggest, "It's dinner time." This will lead to the production of a string of sausages, which Mr. Punch must look after, although the audience will know that this really signals the arrival of a crocodile whom Mr. Punch might not see until the audience shouts out and lets him know. Punch's subsequent comic struggle with the crocodile might then leave him in need of a Doctor who will arrive and attempt to treat Punch by walloping him with a stick until Punch turns the tables on him. Punch may next pause to count his "victims" by laying puppets on the stage, only for Joey the Clown to move them about behind his back in order to frustrate him. A ghost might then appear and give Mr. Punch a fright before it too is chased off with a slapstick. In less squeamish times, a hangman would arrive to punish Mr. Punch, only to himself be tricked into sticking his head in the noose. "Do you do the hanging?" is a question often asked of performers. Some will include it where circumstances warrant (such as for an adult audience) but most do not. Some will choose to include it whatever the circumstances and will face down any critics. Finally, the show will often end with the Devil arriving for Mr. Punch (and possibly to threaten his audience as well). Punch—in his final gleefully triumphant moment—will win his fight with the Devil, bring the show to a rousing conclusion, and earn a round of applause. A traditional Punch and Judy show dating from World War II with the addition of a Hitler Character as a figure of derision to reflect the times. Taken at the History On Wheels Museum, Eton Wick, UK. Punch and Judy might follow no fixed storyline, as with the tales of Robin Hood, but there are episodes common to many recorded versions. 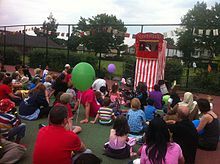 It is these set piece encounters or "routines" which are used by performers to construct their own Punch and Judy shows. A visit to a Punch and Judy Festival at Punch's "birthplace" in London's Covent Garden will reveal a whole variety of changes that are wrung by puppeteers from this basic material. Scripts have been published at different times since the early 19th century, but none can be claimed as the definitive traditional script of Punch and Judy. Each printed script reflects the era in which it was performed and the circumstances under which it was printed. The various episodes of the show are performed in the spirit of outrageous comedy—often provoking shocked laughter—and are dominated by the anarchic clowning of Mr. Punch. Just as the Victorian version of the show drew on the morality of its day, so also the Punch & Judy College of Professors considers that the 20th- and 21st-century versions of the tale have changed into something akin to a primitive version of The Simpsons, in which a bizarre family is used as a vehicle for grotesque visual comedy and a sideways look at contemporary society. In my opinion the street Punch is one of those extravagant reliefs from the realities of life which would lose its hold upon the people if it were made moral and instructive. I regard it as quite harmless in its influence, and as an outrageous joke which no one in existence would think of regarding as an incentive to any kind of action or as a model for any kind of conduct. It is possible, I think, that one secret source of pleasure very generally derived from this performance… is the satisfaction the spectator feels in the circumstance that likenesses of men and women can be so knocked about, without any pain or suffering. An awareness of the prevalence of domestic abuse, and how Punch and Judy could be seen to make light of this, threatened Punch and Judy performances in the UK and other English-speaking countries for a time, but the show is having one of its cyclical recurrences and can now be seen in England, Wales, and Ireland—and also in Canada, the United States, the Caribbean and Puerto Rico, Australia, New Zealand, and South Africa. In 2001, the characters were honoured in the UK with a set of British commemorative postage stamps issued by the Royal Mail. In a 2006 UK poll, the public voted Punch and Judy onto the list of icons of England. Despite Punch’s unapologetic murders throughout the performances, it is still a comedy. The humour is aided by a few things. Rosalind Crone (2006, p. 1065) suggests that, since the puppets are carved from wood, their facial expressions cannot change, but are stuck in the same exaggerated pose, which helps to deter any sense of realism and to distance the audience. The use of the swazzle also helps to create humour, and that the swazzled sound of Punch's voice takes the cruelty out of Punch. According to Crone, a third aspect that helped make the violence humorous was that Punch's violence toward his wife was prompted by her own violence toward him. In this aspect, he retains some of his previous hen-pecked persona. This would suggest that, since Punch was merely acting violently out of self-defence, it was okay. This is a possible explanation for the humour of his violence toward his wife, and even towards others who may have somehow "had it coming." This suggestion better explains the humour of the violence toward the baby. Other characters that had to incur the wrath of Punch varied depending on the punchman, but the most common were the foreigner, the blind man, the publican, the constable, and the devil. Punch is primarily an oral tradition, adapted by a succession of exponents from live performances rather than authentic scripts, and in constant evolution. There exist, however, some early published scripts of varying authenticity. In 1828, the critic John Payne Collier published a Punch and Judy script under the title The Tragical Comedy or Comical Tragedy of Punch and Judy. The script was illustrated by the well-known caricaturist George Cruikshank. Collier said his script was based on the version performed by the "professor" Giovanni Piccini in the early 19th century, and Piccini himself had begun performing in the streets of London in the late 18th century. The Collier/Cruickshank Punch has been republished in facsimile several times. Collier's later career as a literary forger has cast some doubt on the authenticity of the script, which is rather literary in style and may well have been tidied up from the rough-and-tumble street-theatre original. A transcript of a typical Punch and Judy show in London of the 1840s can be found in Henry Mayhew's London Labour and the London Poor. ^ a b "Mr Punch celebrates 350 years of puppet anarchy". BBC. 11 June 2015. Wheeler, R. Mortimer (1911). "Punch (puppet)" . In Chisholm, Hugh. Encyclopædia Britannica. 22 (11th ed.). Cambridge University Press. pp. 648–649. ^ Philpott, A. R. (1969). Dictionary of Puppetry. Seccombe, Thomas (1896). "Powell, Martin". In Lee, Sidney. Dictionary of National Biography. 46. London: Smith, Elder & Co.
^ "A Brief History of Punch and Judy (with an introduction to the characters)". Speckinspace.com. Archived from the original on 23 November 2010. Retrieved 2 August 2012. ^ a b Edwards, Glyn. (2000) Successful Punch and Judy, Second Edition 2011. Worthing: The Fedora Group. ISBN 9780956718914. p. 19. ^ Fraser, Peter (1970) Punch and Judy. London: B.T Batsford. New York: Van Nostrand Reinhold Company. ISBN 0-7134-2284-X. Library of Congress Catalog Card Number: 71-110085. p. 8. ^ Speaight, George. (1955) Punch and Judy: A History, Revised Edition 1970. London: Studio Vista Ltd. ISBN 0-289-79785-3. p. 78. ^ a b c d e Crone, Rosalind (2006). "Mr and Mrs Punch in Nineteenth-Century England." The Historical Journal, 49(4) pp. 1055–1082. ^ Speaight (1970), p. 82. ^ "Puppet show faces knockout punch?". London: BBC News. 8 November 1999. Retrieved 3 September 2008. ^ "around the world with mr. punch » Silly-Season-On-Sea". Punchandjudyworld.org. 14 August 2008. Archived from the original on 23 February 2012. Retrieved 2 August 2012. ^ ""Stamp of Approval for Punch and Judy", BBC News, 20 August 2001". BBC News. 20 August 2001. Retrieved 2 August 2012. ^ "New icons of Englishness unveiled" (27 April 2006). BBC News. 11 June 2015. ^ Proschan, Frank (1981). "Puppet Voices and Interlocutors: Language in Folk Puppetry." The Journal of American Folklore, Vol. 94, No. 374, Folk Drama (Oct.–Dec. 1981), pp.527–555. The American Folklore Society. ^ "Punch & Judy: 1832 Book pdf file". Spyrock.com. Retrieved 2 August 2012. Mr. Punch by Philip John Stead (1950) Evans Brothers Ltd.
Wikimedia Commons has media related to Punch and Judy. The Punch & Judy Fellowship: The largest and oldest organisation of its kind devoted to keeping alive the tradition of Punch & Judy shows. The Punch and Judy College of Professors: detailed site of leading UK professional Punch Profs organisation.